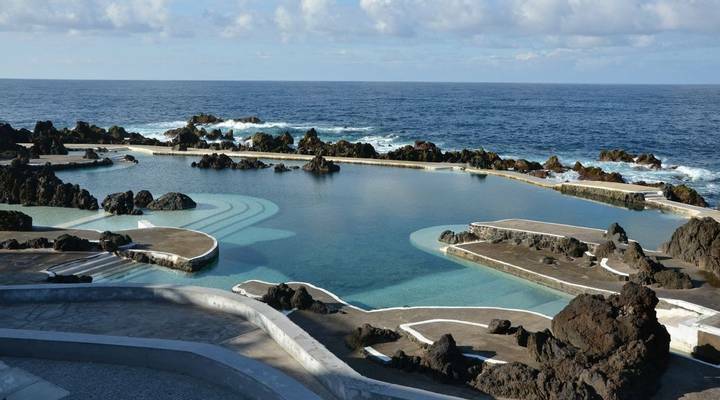 Lava pools, levadas, wildlife, walking, a splash of wine and food in Funchal. Known for its wine and warm weather, Madeira has unsurprisingly been a favourite holiday destination for leisure travellers who are content to enjoy the sun from the comfort of a nice hotel. That’s all changing though. It is now the island’s spectacular mountains, the wildlife, food, and culture that are in the spotlight and our holidays incorporate unforgettable experiences in some stunning locations. Don’t worry though, the wine and warm weather are still included as standard! There’s a wealth of largely untapped variety on the island due to its topography and sub-tropical climate. Our carefully planned holidays give you an overview of Madeira but focus on areas that are often overlooked by visitors. Our Garden Island holiday, for example, showcases the perfectly manicured gardens renowned in and around the capital of Funchal. They could grace the shores of any Italian lake and are well worth exploring. We also focus on the immense natural beauty of the island’s native flora and fauna during this leisurely trip. Our Nature and Wildlife holiday does what it says on the tin as the island is a real draw for those with a keen eye for natural history. The volcanic landscapes create a dramatic backdrop but it is the ocean which surrounds Madeira that is the biggest draw for wildlife watchers. This is one of the best places in Europe to swim with dolphins and we include an unforgettable snorkelling experience during the holiday. The island’s volcanic beginnings make for a dramatic and diverse landscape and its Portuguese heritage and colonial past have created a wonderfully vibrant culture. Our holidays operate between April and October in order to make the most of Madeira’s climate and maximise wildlife viewing opportunities. The warm water, which can be around 23 degrees Celsius, make a dip in the ocean a must and is ideal for swimming with the resident dolphins. Both holidays are based in the island capital of Funchal and are within easy reach of the town’s shops, cafés, and restaurants. It’s a fascinating town to explore and the markets, street stalls, and colonial architecture make for some wonderful sightseeing during your free time. As the island was a stop-off on many trading routes, the variety of plants that can be found here is staggering. The annual flower festival in Funchal is a famous spring attraction but the formal gardens you’ll visit with us during our Garden Island holiday are stunning at any time. However, it’s not all about Funchal. Our trips also explore the mountain peaks and plateaus, the wild western coast and the eastern vineyards, and the views will take your breath away. Depending on which of our holidays to Madeira you choose you’ll also visit either the island of Porto Santo or explore the Desertas Islands to further experience the Madeiran Archipelago. We always enjoy exploring somewhere new and different and when our Product Manager Jono returned from his initial Madeira planning trip, we were all extremely envious of how much he had seen and done. He began by casually dropping into the conversation that he had particularly enjoyed a dip in the natural pools which were formed by solidified lava on the west of the island (we give you the chance to enjoy this experience during both holidays). The levadas (mountain irrigation channels which supply water to the fields below and are now regularly used as walking routes) needed a little explaining. However, his panoramic photos of the scenery from one of the levada trails convinced us to include a walk in both holidays. Thus, our Garden Island holiday includes a gentle short walk and our Nature and Wildlife tour includes a 6.3 mile trip on the Levada do Rei. Next, Jono showed us his GoPro footage of the dolphins, which we initially didn’t believe was real. It was the fact that they had chosen to come and investigate him at such close quarters of their own free will that was so great to see. Amongst other things, Jono (who by now was rather relishing his task) regaled us with stories of wine tasting (our hearts bled for him having to try so many wines) and incredible food such as espetada (marinated beef which is then grilled on woodchips), fresh seafood and colourful markets offering the freshest of local produce. These were all within easy reach of the accommodation he had carefully selected. It was at this point the meeting ended, as most of us had stopped listening and were busy working out which week we could head to Madeira ourselves!